Introducing Cherry Blossoms script with exciting spring DIY collection with different girly elements: ribbons, flowers, birds, deers, flowers etc. for your wonderful spring designs. 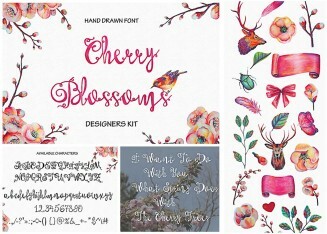 Tags: cherry, cherry blossom, cute, deer, flowers, font, hand lettered, hand made, ribbon, romantic, script, spring, spring elements.